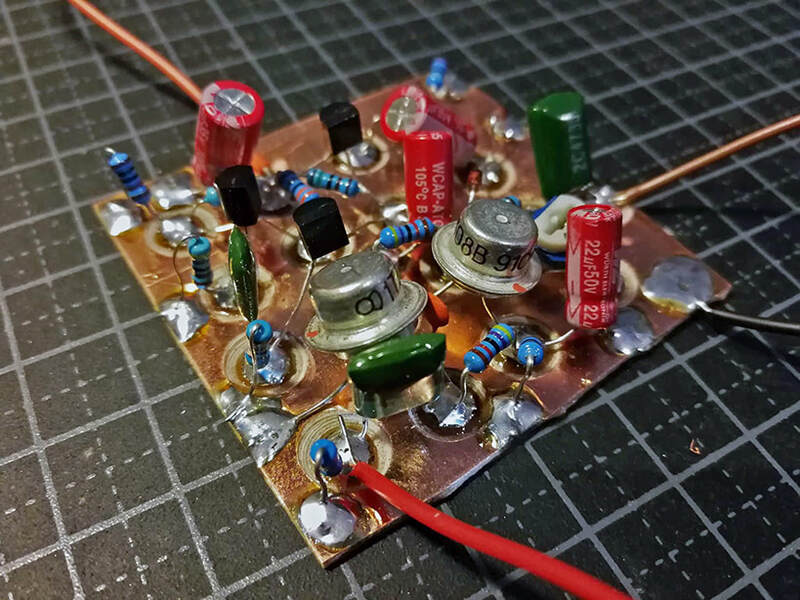 The 1985 Guitar Synth is the first fully digital Parasit DIY project followed by the (non-diy) Bitbreaker Deluxe. The goal with the Bitbreaker Deluxe was to make an octave down pedal with as few components as possible (I wanted it to fit a 1590A enclosure), similar to the 8-bitar, but with more features. This was only possible using a microcontroller chip - The Attiny85. It is a really cool chip, because it doesn't need any external components to run and it's very small. It's a bit harder to program for, but I enjoyed the challenge/limitations. I got into programming this summer, because it's something i've been wanting to learn for a long time. It has opened up a world of possibilites, so a few upcoming (non-diy) pedals will have digital chips. 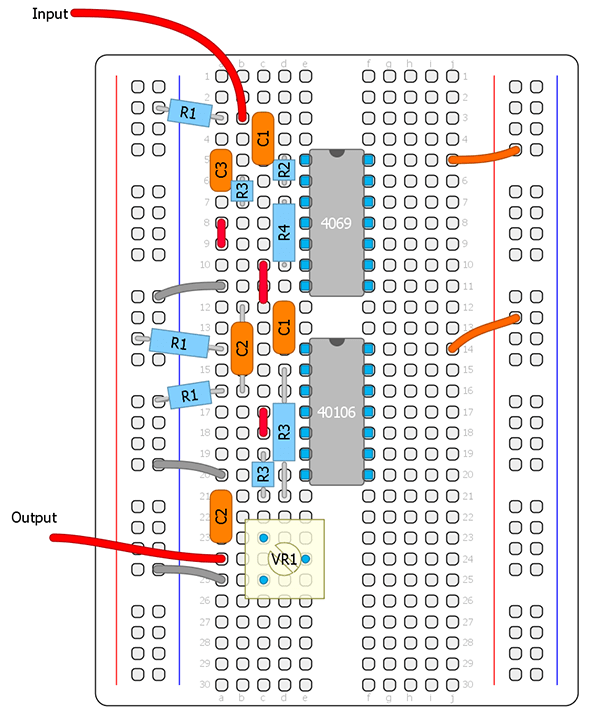 But I'll try to keep most of the future DIY projects being fully analog/CMOS based, since there's a bit of hassle to sell pre-programmed chips. I have been wanting to do a guitar synth with other waveshapes beside square waves. 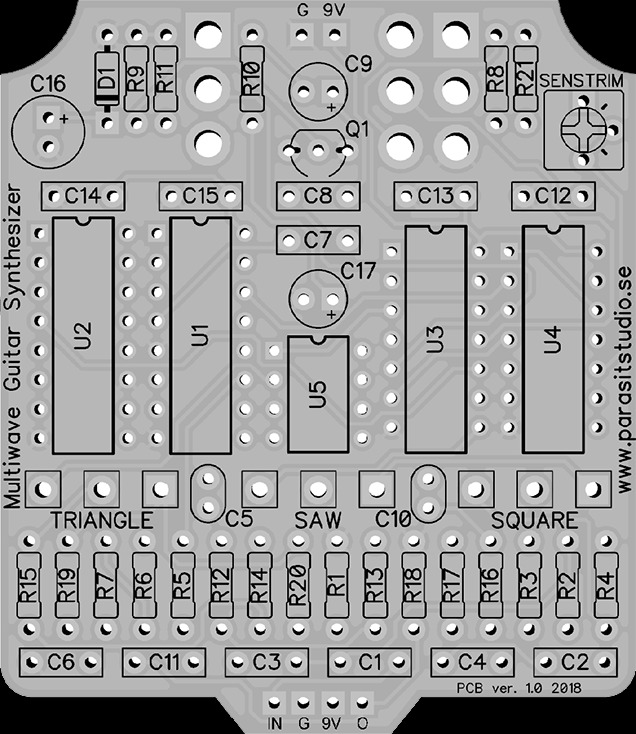 This has resulted in the Multiwave Guitar Synth which will have sawtooth, triangle, square and a special ringmod mode aswell. It's a fully analog pedal. I expect this to be released very soon (early january if everything goes well). 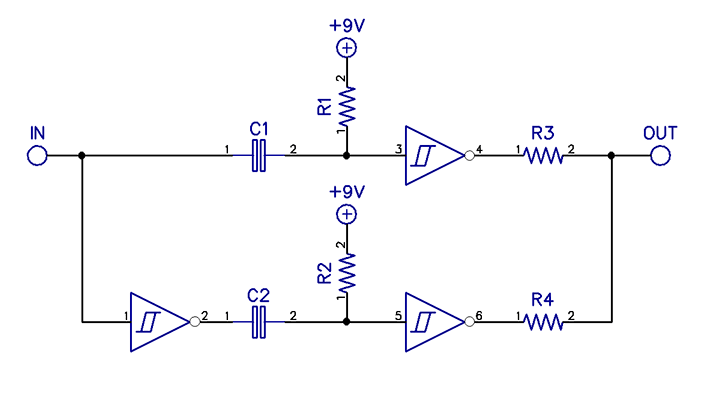 An ADSR (which stands for Attack, Decay, Sustain, Release) is something you usually find in synthesizers to control the envelope of filters and amplifiers. I've been working on something similar for guitar, with the Attack, Sustain and Release features. 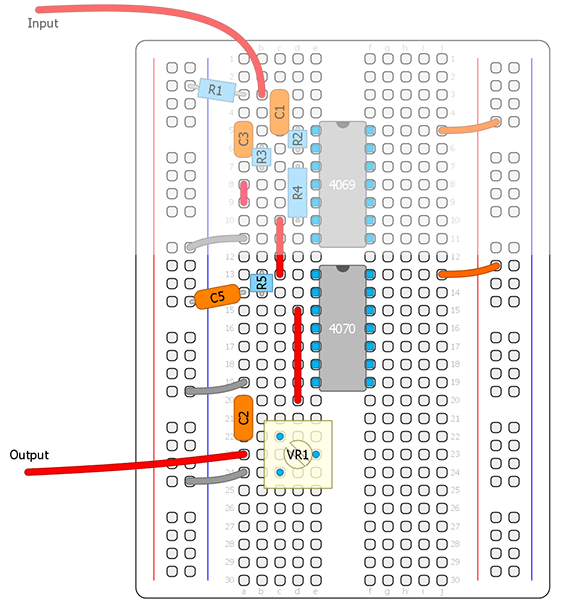 It will be triggered with either a foodswitch or an envelope follower to control a VCA. So that you can use it as a swell/fade in pedal, a wierd tremolo (it will have an auto-retrigger feature) or a glorified killswitch. It will have a external trigg input and CV output for use with other gear. This pedal is still in developement. That's all for now. More info about these projects coming soon! 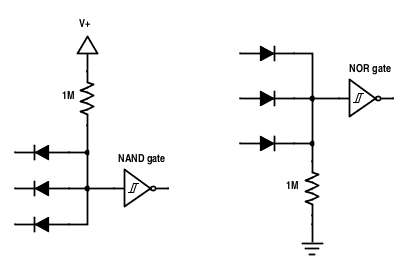 The "Manhattan style" is a very old method of circuit construction. 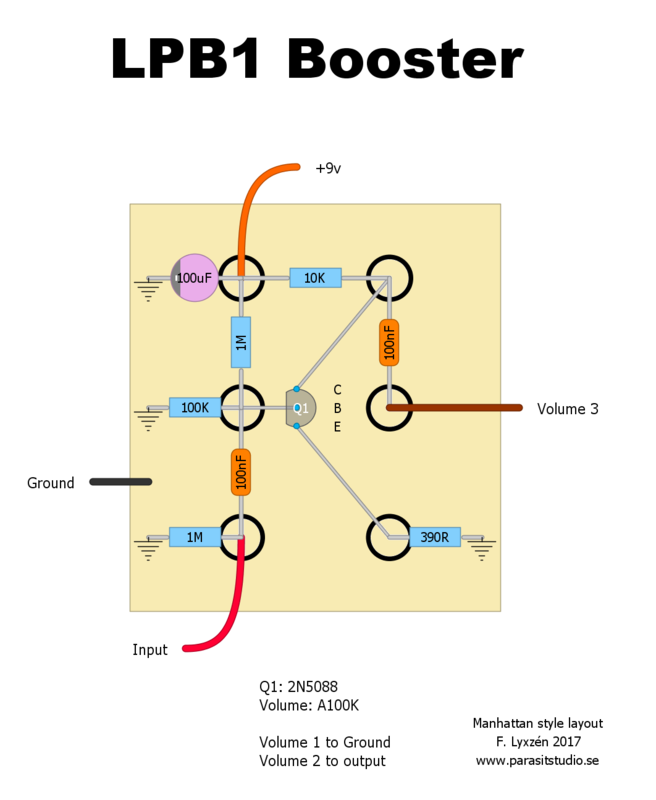 It's especially popular among radio amateurs for high frequency circuits because it has a solid ground plane that helps to reduce interference and noise. Some people would probably not agree with the disadvantages I listed since I've seen people go crazy with complex build using IC chips and even SMD components on Manhattan style builds. To build Manhattan style you need a copperclad board. It only needs to be a one-sided copper layer. The first step is to make small cutouts in the copper for the component pads and cut the board to a good size (to fit the enclosure that you want to use). I use a bench drill with a circular drillbit to make small "islands" in the copper. Just be careful so you don't drill all the way through. 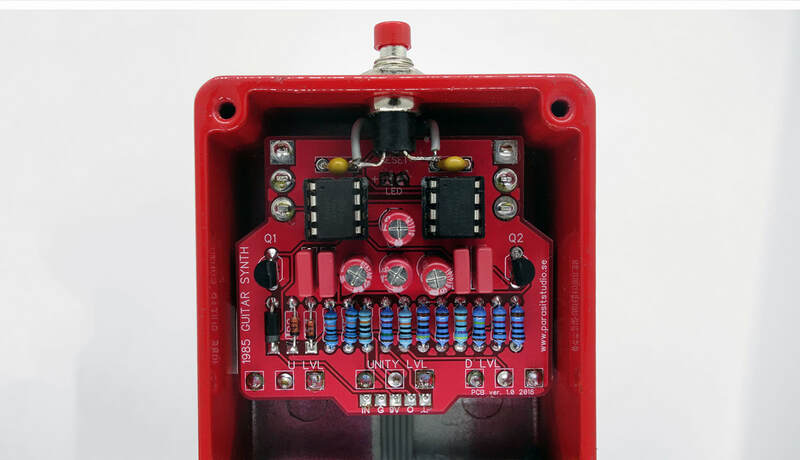 It's a good idea to use a multimeter to check that all the pads are not conducting to the rest of the board (which will be connected to ground). Another common method that doesn't require a drill is to cut out small pieces of copperboard (from another piece of board) and glue them onto the main copperboard to serve as component mounting platforms. ​I'm using a "diamond hole drill bit" like this one (the 8mm one). 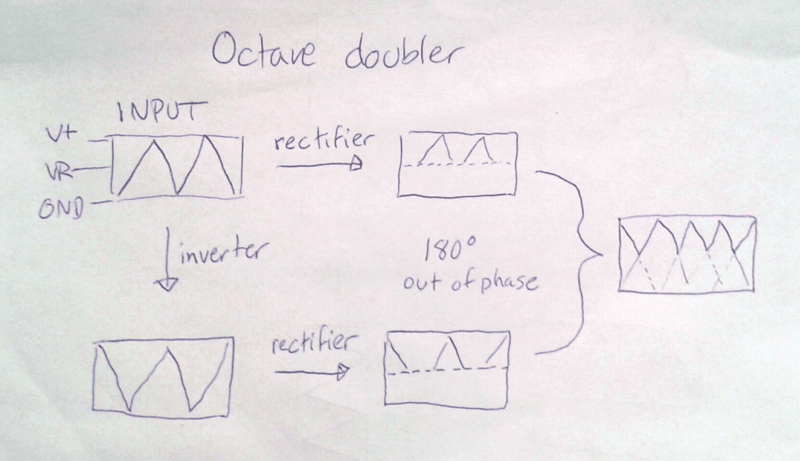 ​Before preparing the board, it's a good idea to make a sketch of the board layout. Converting a schematic to a Manhattan style layout is generally very easy since the layout will closely reflect the schematic in most cases. 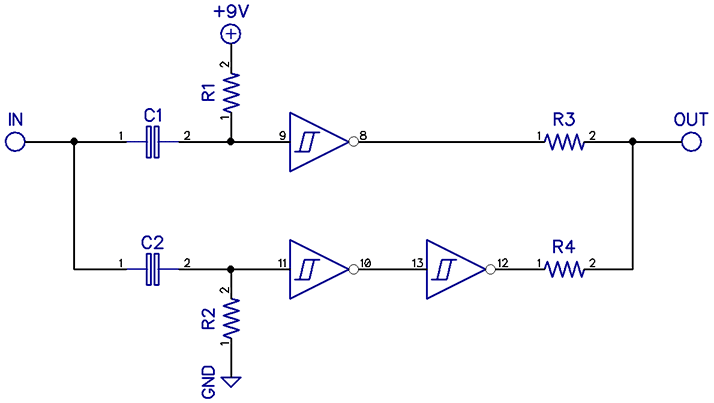 Here's to the right is an example of a circuit, the LPB1 booster - a very simple transistor amplifier. ​The first thing you need to do is to identify and count all the common nodes (or "nets" as they are typically called in PCB software). This is how many pads we need to drill on the board. Don't count the ground connection, as it will be connected to the rest of the copperboard as the groundplane. As you can see in this example, the layout follows the schematic with a few minor changes (just to have the pads lined up nicely). I normally just use pen and paper to make the layouts, but I wanted it clean and easy to read for this presentation. I used very hot humbuckers. That's why the attack sounds so compressed. 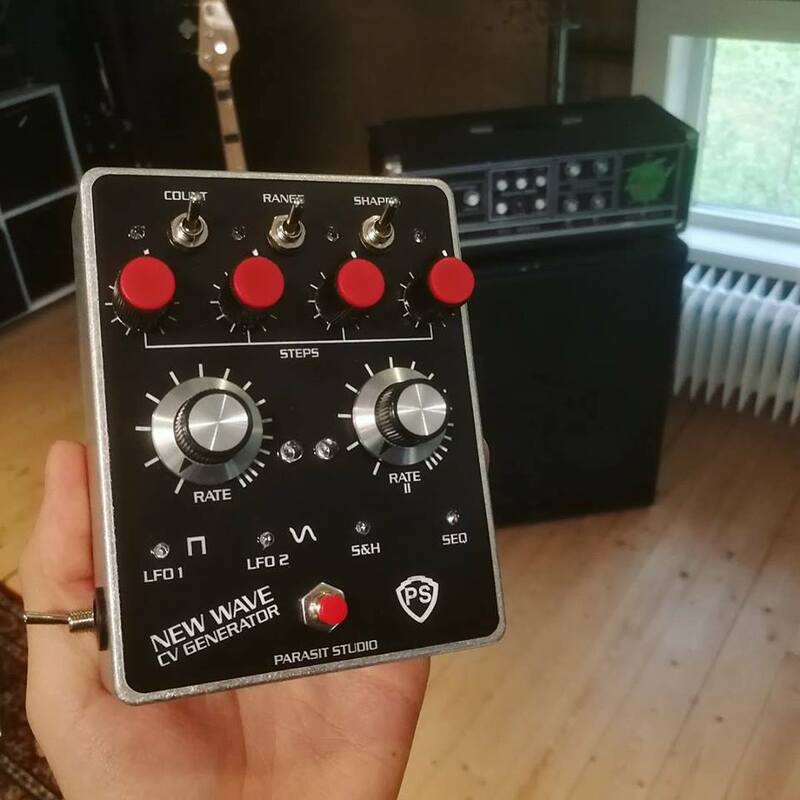 Another one-knob fuzz. This is more of a ordinary fuzz loosely based on a fuzzface topology. It cleans up really well when turning your guitar volume down. I wanted to find a use for all those russian transistors that I have laying around so the signal path uses two germanium transistors. The rest of the circuit is a discrete voltage inverter, designed specifically for the manhattan style in mind so I could keep everything on the same board. 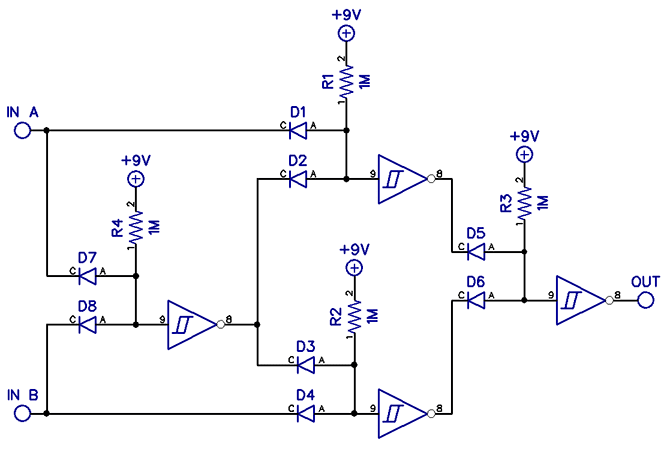 You can play around with the values for the input and output capacitors for different bass response and thickness. The name is a homage to the band The Germs (because it's a germ-anium fuzz hehe...). 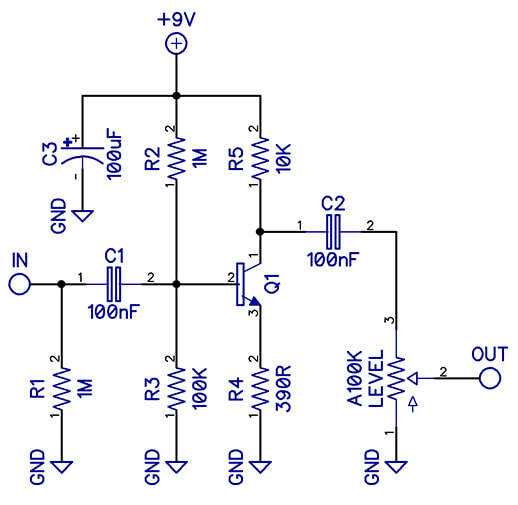 ​​The discrete voltage inverter is not something I would recommend using for any other build style that can accomodate IC chips since an IC based voltage inverter will be far superiour in every way. Even through it might seem like a step backward, it's been really fun to make something different for a change. Expanding my bag of tricks, learning and challenging myself to come up with new stuff is what keeps this hobby fun and interesting for me. I haven't seen many pedalbuilder using this technique and I was inspiried to try it from a great HAM radio guy that I follow on youtube. In short, it's an analog monophonic octave down pedal. 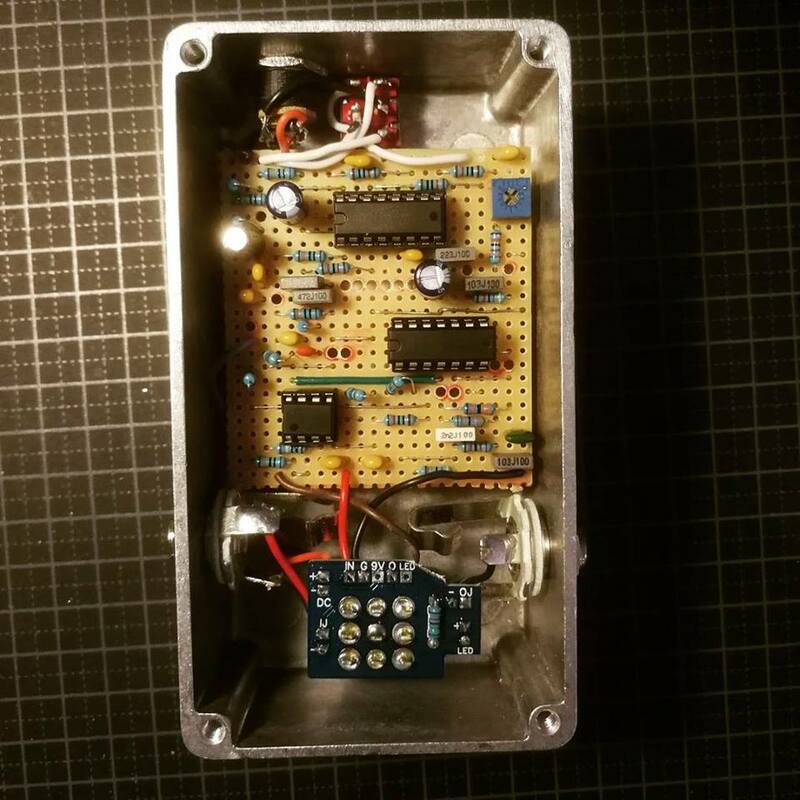 I wanted to do something a bit different, so this pedal uses a CD4046 PLL to do the freqeuency dividing, insted of a D-flip flop that are typically used in analog octave down pedals. This allowed me to add a couple of fun features like the Detuned Mode and the CV input. It will work best for guitar since the tracking gets alittle bit slower at the lower notes, but you can clean up the tracking by using the neck pickup. I also have found that it helps alot to palm-mute the strings alittle bit when playing the lowest notes. I will not share the schematic for the U-235, so please don't ask for it. 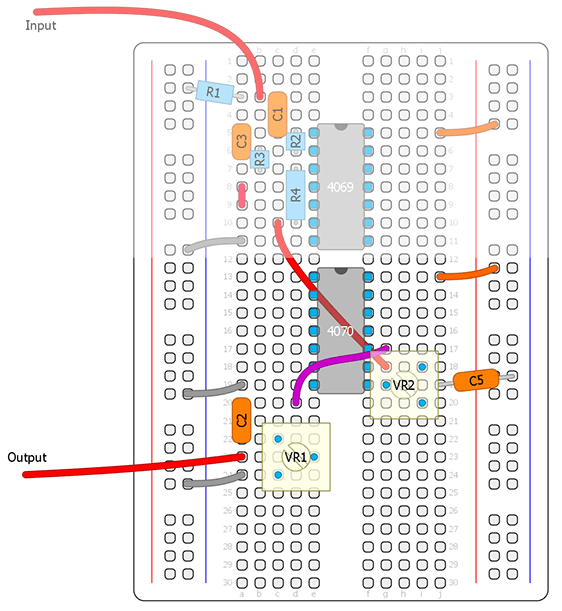 But when I have time I will try to write another part for the CMOS Workshop series that will explain how to set up the 4046 as a frequency divider so that you can breadboard it yourself and play around with it. In the last half of the demo I'm using the "New Wave CV Generator" (more info on that project coming soon) as a Control Voltage source, but you can hook up any LFO, from a synthesizer or another pedal. 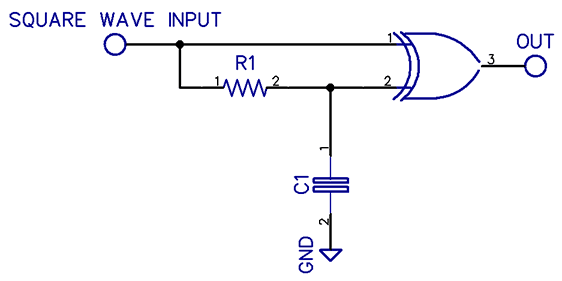 Building tip: Make the input and output wires as short as possible. There's alot of high amplitude square waves going on inside the circuit and it can easily bleed into the clean signalpath, making it sound less clean than it's supposed to be. Never run the wires under/over the board. Just a small thing to keep in mind. New versions released, upcoming projects and more! I'm happy to announce two new projects coming soon, summer sale and more! 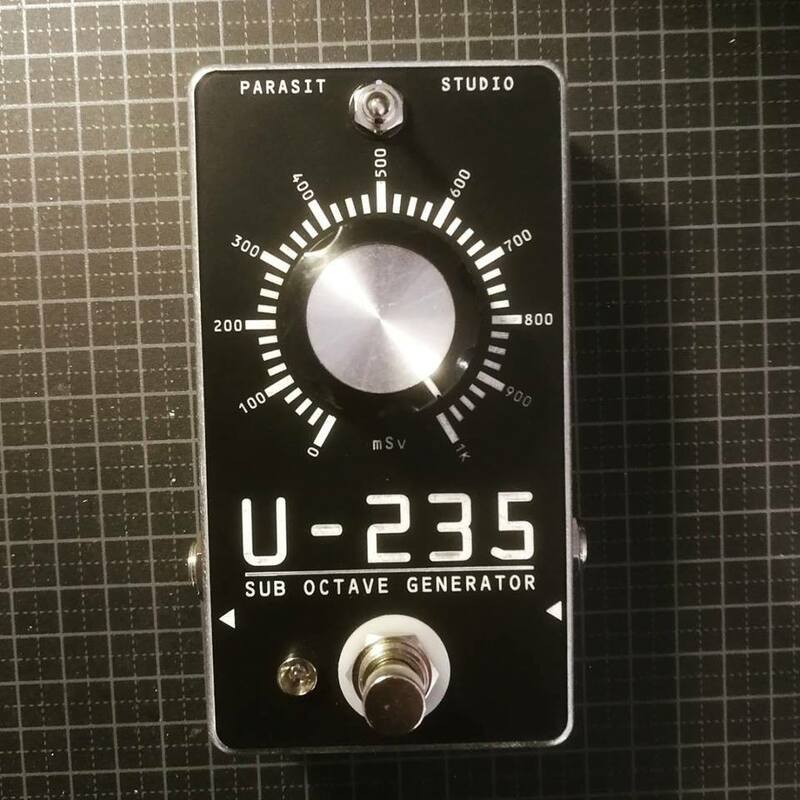 The U-235 is a "clean" octave down based on the CD4046 PLL chip. It tracks very well both with guitar and bass. Here's a quick phone demo using the bridge pickup on my SG. I built the prototype on vero. I will share the layout once the PCB's are ready aswell. 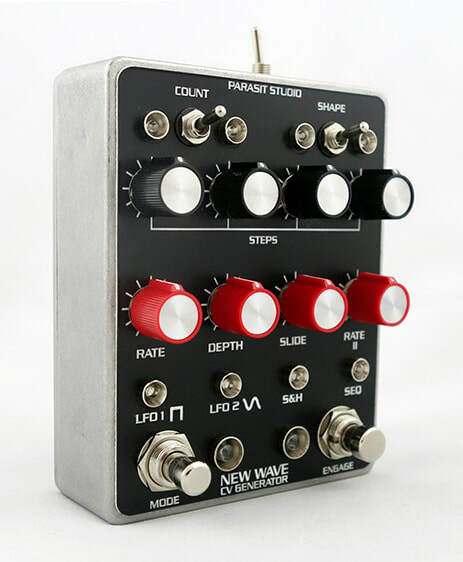 The New Wave is basically a stand-alone LFO board that can be used with synths or other effects to modulate the sound with various waveforms. It doesn't make any sounds on it's own. First prototype build. The final version will look a bit different. 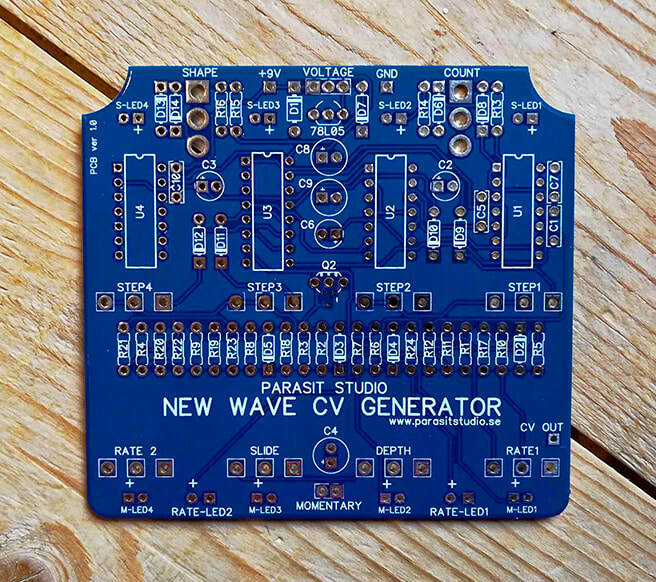 In the demo i'm using it with the Into the Unknown guitar synth which already has a pad on the PCB for a CV input, but several parasit studio projects will be updated with optional Control Voltage inputs, such as the 0415 Guitar Synth, Sentient Machine, Green Currant and more. 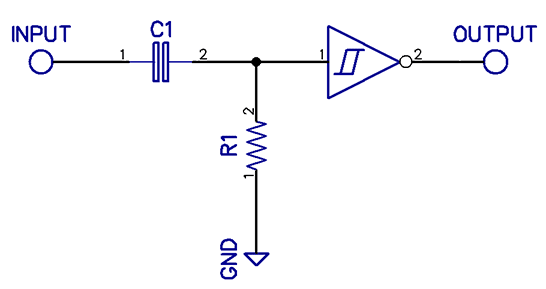 ​The CV range is switchable between 0-5v or 0-9v. More into coming soon on the new projects! I expect about 5-8 weeks until release. 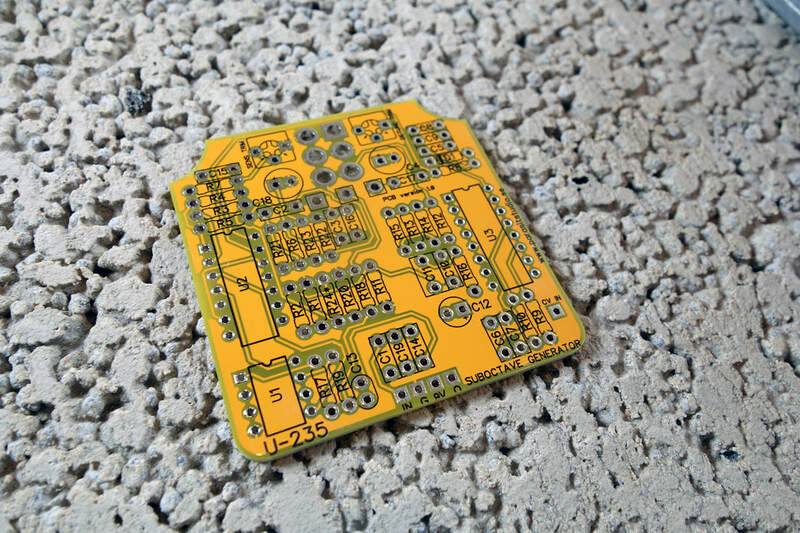 This PCB has gotten a facelift, and is now green to fit the name. Circuit-wise it's the same. The PCB has also gotten a facelift. Four new versions of old projects are released and now avaliable in the webshop. 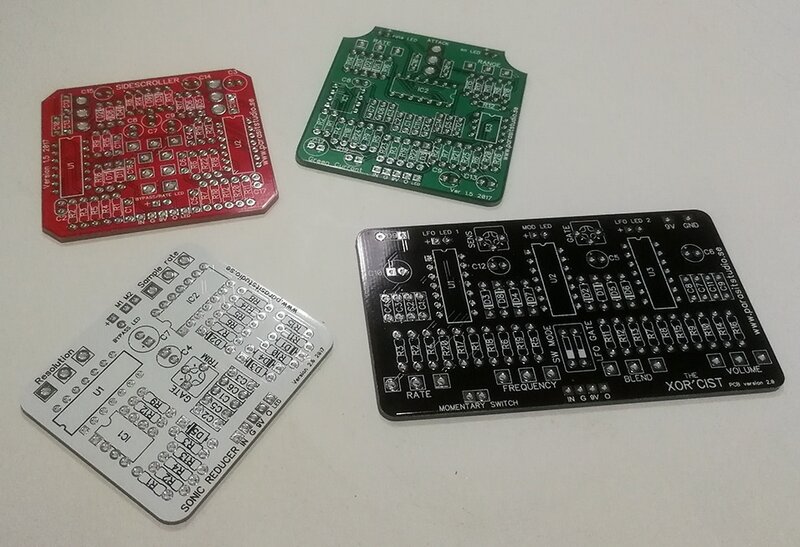 I also have new 3PDT-boards with LED + CLR in stock. To celebrate these news I now offer a 10% discount in the webshop. Just enter the code "summersale" at the checkout. Valid until 5/7. That wraps up this long overdue post. I hope everyone out there is having a great summer. 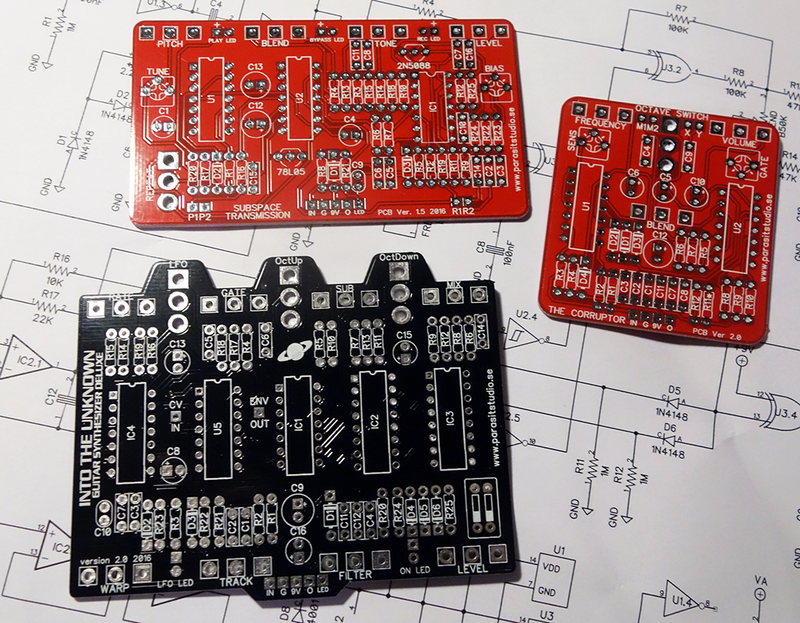 New PCB updates released: Into the Unknown 2.0 and more! The Into the Unknown has been updated to solve the ticking issue that some people were having. 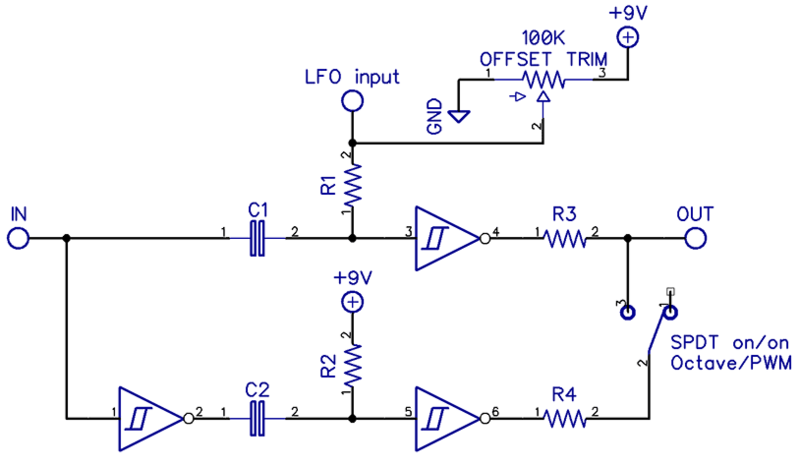 The LFO now completely shuts off in the middle switch position, to avoid ticking when not using the LFO. 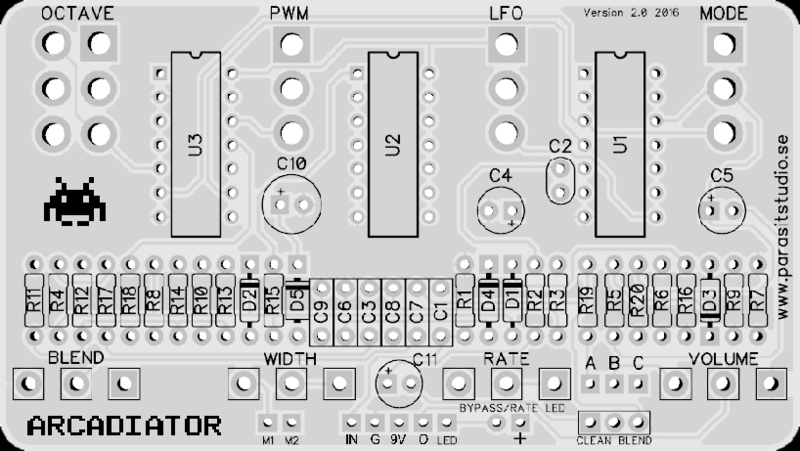 A LFO gate is also added (similar to the Arcadiator) which shuts off the LFO when not playing. This gate can be switched on/off with board mounted DIP switches. The filter and the gate pot are now reversed to easier reset the pedal by turning all pots counter-clockwise. The first Subspace Transmission PCB suffered for below unity output volume. This has now been fixed with the new PCB. The Corruptor has been updated significantly to be more than just a ring modulator. 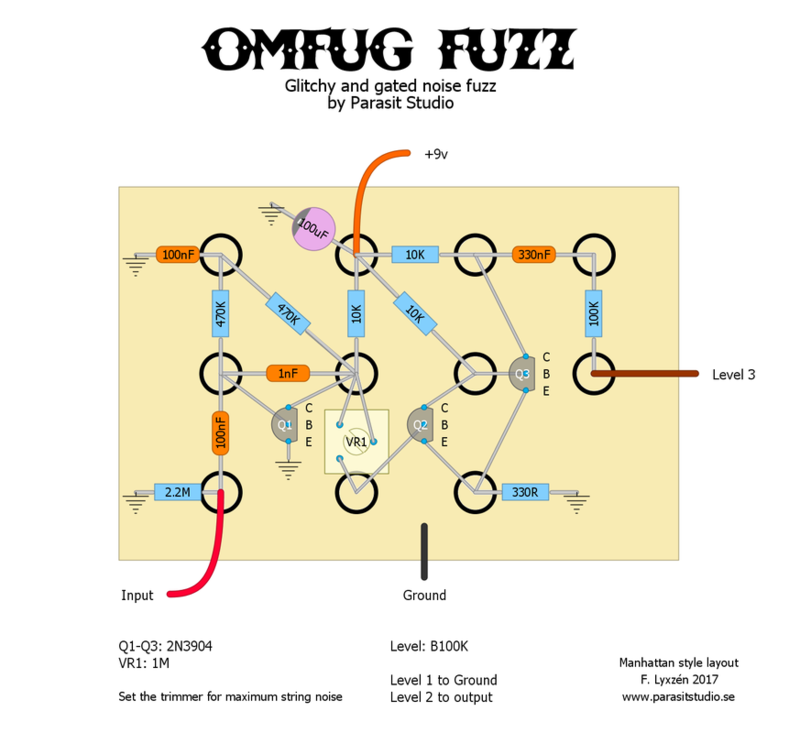 It's now also a octave fuzz! Demo of the old Corruptor. A new demo for the updated version is coming soon.